The morning of March 21st, like every morning we've ever had in Mexico City, was gorgeous. We woke up excited, ready to follow our footsteps wherever they might lead us. Jessica's big sister Sheila and brother-in-law Jeff had arrived the day before, and we were eager to begin our first full day of exploration together. We grabbed a marvelous breakfast at the little restaurant across the street from our hotel (for the record, a nice heaping plate of chilaquiles is my favorite breakfast of all time) and brainstormed about what to do next. We decided to set our sights on the picturesque little pueblo of San Ángel. 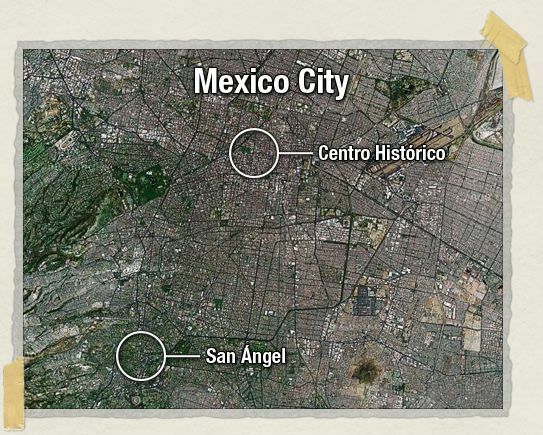 San Ángel was once a quiet little village well outside of Mexico City. Despite having been "swallowed up" by the advancing sprawl of the city, it still stubbornly maintains that unhurried provincial atmosphere. 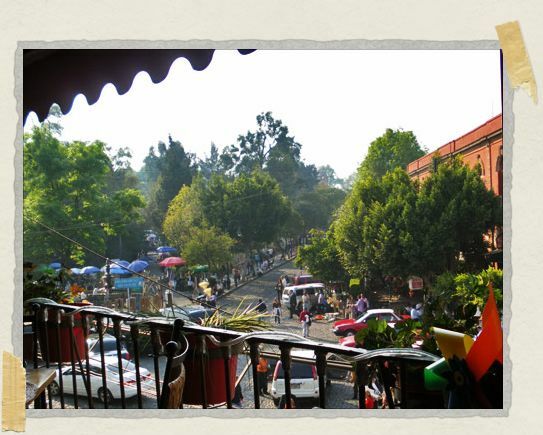 Cobblestone streets are sprinkled with lovely little churches and hundred-year-old houses, shaded by green, leafy trees, and all set about with charming little restaurants: the perfect place to kick back with a cerveza and a bowl of tortilla soup. It feels like it's a million miles from the city. 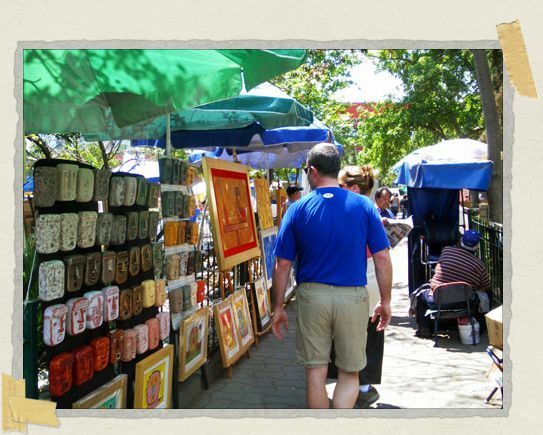 On Saturdays, this sleepy little neighborhood comes alive to host the Bazar del Sábado, a massive art market that spills out from the central park into the surrounding streets. After an hour of so of walking amongst the varied treasures on display, that cerveza was starting to sound pretty good. We all made our way to the Restaurante Don Carlos, where Jessica and I had stopped for a bite during our last sojourn in Mexico City (and to which we'd been eagerly hoping to return ever since!). After ascending the long, winding staircase up to the second-floor restaurant, we grabbed ourselves a table along the balcony, where we could overlook the art market as we tucked into some of that aforementioned tortilla soup. The other day, Jessica wrote an entry called Moments of Random Happiness, about all the wondrous things you unexpectedly stumble into when traveling. After we left our restaurant, we made our way over the Convent of El Carmen. This museum was the home to Catholic nuns for hundreds of years, and a number of wealthy personages were interred in the crypt there. During the Mexican Revolution in the late 1910s, that crypt was ransacked by troops looking for treasure. Instead, they found a number of well-preserved mummies, which are now on display in the museum. On a whim, we'd decided to go give the mummies a look. We never did wind up seeing the mummies, but instead we stumbled onto something far more special: a wedding was taking place in the convent at that moment. Wikipedia defines serendipity as "the effect by which one accidentally discovers something fortunate, especially while looking for something else entirely." The four of us stood quietly against the back wall for several minutes, basking in the happy scene and marveling at our serendipity. And then it was time to make our way back up to Centro Histórico. We'd made our way down to San Ángel by means of our beloved Mexico City Metro. From the metro station to the middle of San Ángel itself was a walk of about 15 minutes. It was a lovely walk – some of it passing through quiet parks, some of it along marvelous cobblestone streets – but we were feeling adventurous, and had decided to try to return along a different route. We'd passed a bus stop earlier in the day, and thought it would be fun to head back to Centro Histórico by bus, so that we could see a little bit more of the city along the way. 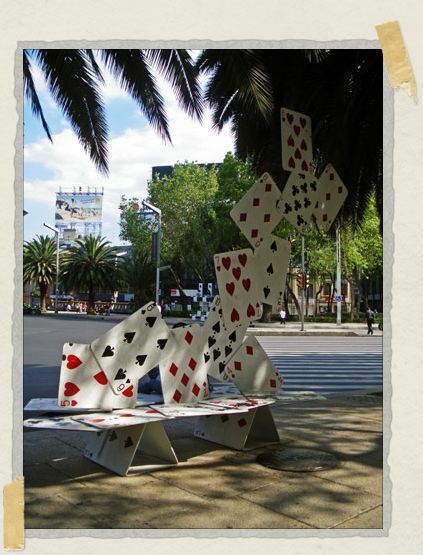 The stop was on the corner of the massive Avendia Insurgentes, and I knew that if we got onto a northbound bus we'd eventually run into the Paseo de la Reforma, our next destination. 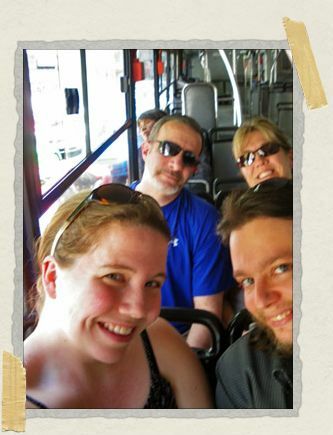 The only problem was that we'd never taken a local bus in Mexico City before, and didn't know the protocol. Undeterred, we made our way up onto the platform to try and figure it all out. We knew which bus to get onto, and I knew I'd be able to tell when we should get off (Paseo de la Reforma is an enormous street), but the thing we didn't know was how to buy a ticket. It looked like you bought your tickets from a little electronic dispenser, the kind you'd see at any US subway station, and then fed them into a nearby turnstile to be able to make your way out onto the platform. So it seemed pretty straightforward at first. Upon closer inspection, though, we realized that it wasn't dispensing tickets, but rather refilling little transit-cards of some sort. The security guard saw us looking confused and made his way over to ask if he could help. Using Jessica as our interpreter, we explained what we were trying to do. He told us (again, through Jessica as an intermediary) that we needed to buy a card first, and then we could put four fares on it and all use the same card. The college student in front of us overheard all of this. Flashing us a huge smile she offered to put our fares on her card if we wanted. Gratefully, we accepted, and handed her the 20 pesos (about US $1.50) for our four fares. She added it to her card, and then stood beside the turnstile swiping us through one by one. Another young man helped lead us over to where we should wait for the bus. It's not really possible for me to put into words how much little interactions like this mean. When you're thousands of miles from home, that kind of helping hand means a whole lot. And we had more little moments like those in Mexico City than I can count. Everywhere we went, people were helpful and sweet and open. It's just such a special place. The bus ride was marvelous. The metro there is so convenient I'd forgotten how much the two of us love riding around in buses. I love the little snapshots of a city you get from a bus, all the quirky little things you pass by that you'd never see otherwise. That buside, too, was "cheesesteaks and ketchup" for me. 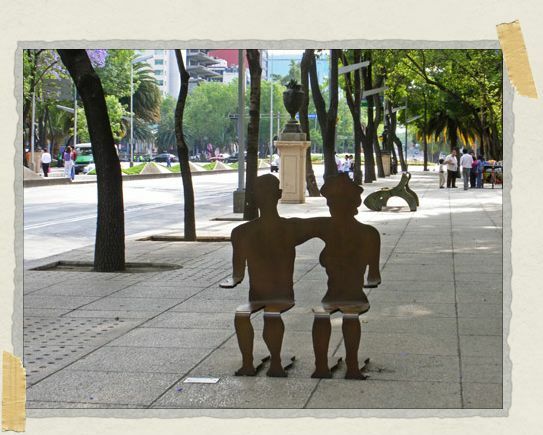 Eventually, we disembarked at the intersection with Paseo de la Reforma. 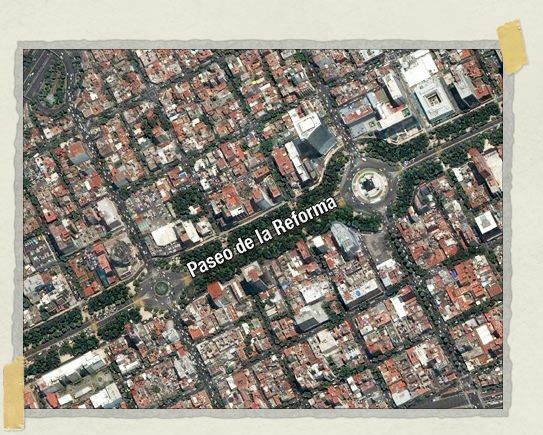 Reforma is an enormous street connecting Centro Histórico on the east to the massive Bosque de Chapultepec ("grasshopper hill park") on the west. It's lined on both sides and along the middle with trees, including some absolutely massive palm trees. 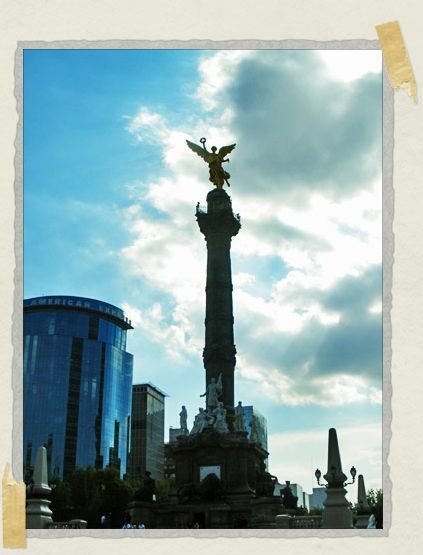 It's one of the iconic symbols of Mexico City, and a gorgeous place to talk a stroll. We started heading west, towards El Ángel de la Independencia (itself another iconic symbol of the city). And along the way we passed some of the benches. Eventually we made it down to El Ángel, who was built a century or so ago to celebrate 100 years of independence from Spain. This is one of my favorite places in the city. It was here that we encountered another moment of random happiness. Well, actually, I suppose it should count as two moments. 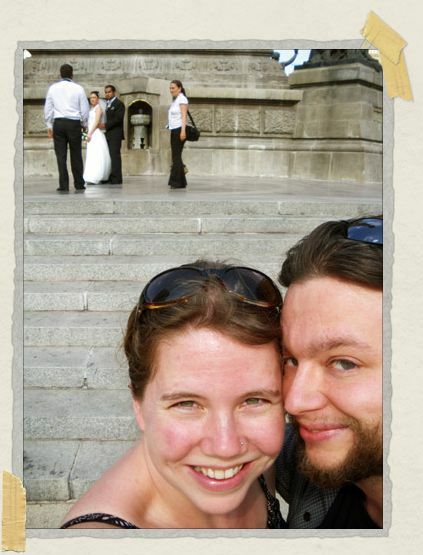 You see, there were two different couples there (on opposite sides of the monument) taking their wedding photos. Three weddings in one day! That has to be good luck! Afterward, we started walking back up Reforma, towards Centro Histórico. We stopped along the way to indulge ourselves in a little ice cream. As I consumed the last of my cone and massaged my somewhat weary feet, I marveled at how well the day had been going. We could have gone to bed then and it would have been a rousing success. But the day wasn't over. We made our way back to our hotel to take a little pre-dinner siesta, turning off Reforma to walk alongside lovely and historic Alameda Park. It was at about that point that we realized something was going on. When Jessica and I had checked into our hotel a couple of days earlier, the adorable old bellboy who showed us around enthused about a music festival that would be happening the next Saturday. He made it sound so fun (they'd be closing off the street for live performances) that we were disappointed we wouldn't still be there. As we walked along the park, we'd realized that he'd meant this Saturday. Festivities were clearly already underway. The park was filled with huge crowds, food vendors, and musicians, and we could hear several concerts going on at once. As we crossed a street, we looked north and saw a few corners up that they'd closed off the streets and erected an enormous platform in the middle of the intersection. A self-proclaimed "blues" band onstage was playing music that sounded a lot more like metal to the four of us. There was so much going on, but we really needed a bit of a recharge before we explored it all. We continued on toward our hotel, excited for what the evening would bring. Along the way, we passed a couple of "living statues" – people in costume and bodypaint standing completely still, imitating statues. Entranced by one, I dropped a peso into the box in front of his platform. Shudderingly, jerkily, acting as if he was a robot, he pivoted towards me and extended the box in his hands, opening it. Inside were a number of tiny pieces of paper. I took one. 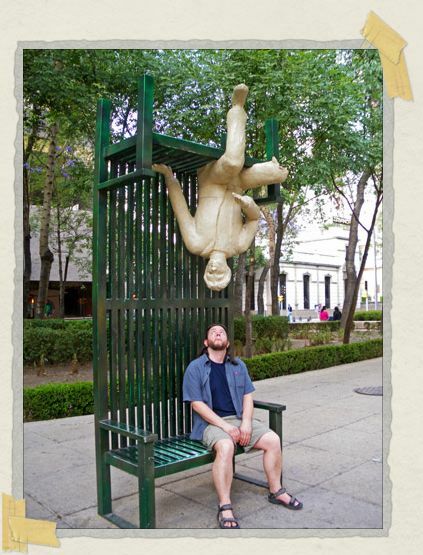 Jeff next dropped in a peso of his own. 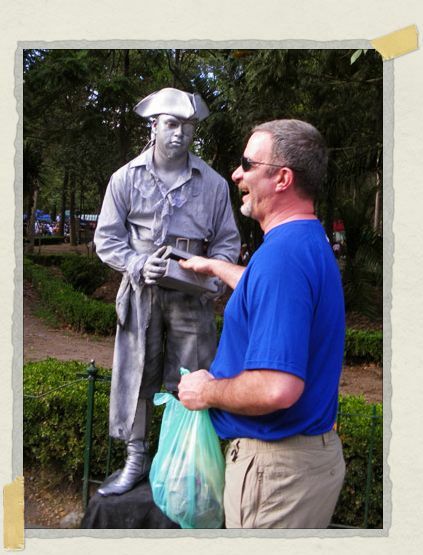 Our statue had a little fun with him, though, momentarily trapping his fingers in the box. As we resumed walking to our hotel, I opened the fortune and read it: El mayor regalo que les puedes dar a los demás son momentos maravillosos e inolvidables. I turned to Jessica (our resident translator) to find out what that meant. She told me that it translated to, roughly, "the greatest gifts you can give are wonderful and unforgettable moments." That would have been enough. But it wasn't all. We emerged from out hotel into an enormous party. The street had been closed off and was absolutely packed with people. Musicians performed on street corners, in the middle of intersections, outside of restaurants and shops. Parades, some pre-planned and some clearly spontaneous, would march by, made up of chanting college students or a cacophony-producing horde of drummers. Everywhere people were cheering, dancing, smiling, laughing. The atmosphere was electric. We emerged into the enormous Zòcalo, the epicenter of this massive city. Along the north side loomed the enormous and ancient Catedral Metropolitano. Along the east side stood the magnificent Palacio Nacional. And in the center was erected an enormous stage. It was the Mexico City Philharmonic Orchestra. And they were simply amazing. There are no words. It was just an extraordinary moment. Eventually, we made our way north to the venerable Hosteria de Santo Domingo. Nearly a centry and a half old, it's supposed to be the oldest restaurant in all of Mexico City. But that's not why we were going there. The Hosteria is a marvelous old place, rich with a history all its own. And yet it's also an enjoyably non-touristy place, catering mostly to locals (and the occasional hedgehogs). 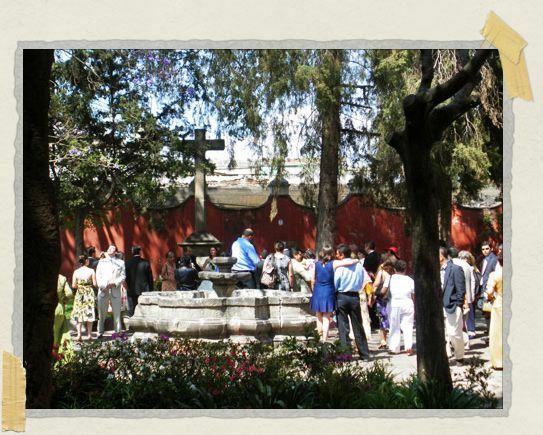 We'd been there during our first trip to Mexico City, and were eager to share it with Sheila and Jeff. As we relaxed and enjoyed some mojitos and margaritas, a marvelous grande dame in an elegant dress serenaded the restaurant. An elderly man in a tuxedo sat beside her, accompanying her on the piano. The place just could not have been more atmospheric. But the atmosphere wasn't why we were there. We were there for the magnificent chiles en nogada. This sumptuous dish consists of a large mild poblano chile stuffed with meat and fruit, drizzled with pomegranate seeds and covered in a walnut cream sauce. It's a classic of Mexican City cuisine, and a traditional New Years meal. The Hosteria de Santo Domingo is famous for serving it year-round, and is in fact known locally as el catedral de chiles en nogada. Before we began, though, I stopped to propose a toast. My nephew Thomas had been born just a few dozen hours earlier. We drank to Thomas, welcoming him into the world. Welcome to the world, Thomas. It's a wonderful, unforgettable place. Such a happy thing to read on a rainy Monday. I've really been enjoying your posts. and Jess? cuando aprendiste español, linda? All of this took place within a single 24-hour period? Magical. And cheesesteaks-and-ketchup is still wicked-cute. Hay lady! How have you been? We've been missing you something awful. I have visited every single place you described in this post and I swear that "seeing" them again through your eyes was almost better than the actual visit. Thanks, Meliza! That means a lot. All of this took place within a single 24-hour period? More like a 15-hour period or so, actually. Your dual gifts of treasuring and uplifting what passes for ordinary (and accepting the tougher parts of travel) always makes your storytelling, and the reading of them, delightful. Wow, Shana, I'm just blown away by this comment. Thank you so so much. We've had entire weekends away that weren't as filled with sights and sounds as that busy day in Mexico City, Tim! I enjoy surface-level travel, whether on foot or bus (or streetcar, as we do in New Orleans). As much as I love the convenience of the subway in New York, you simply don't get to see as much. 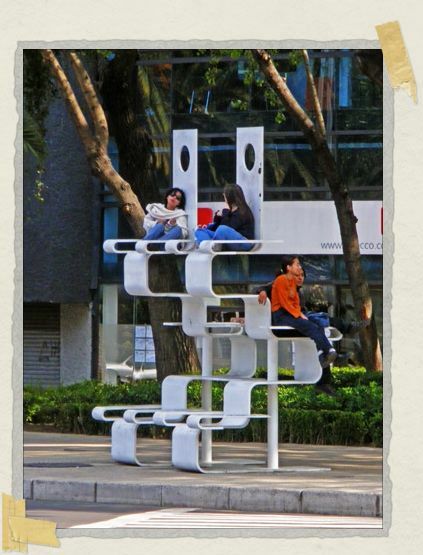 Oh, and I love those benches! The chiles sound good, but I'd wager they'd be better with hot, instead of mild, chiles. Heh. It was an especially good day. I remember saying to Sheila and Jeff the next morning "Um, for the record, it's not always as good as it was yesterday. That was a really good day." The chiles sound good, but I'd wager they'd be better with hot, instead of mild, chiles. It may be heresy, but I agree. Of course, I pour hot sauce onto everything.